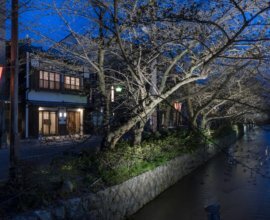 The famous Takasegawa River -- visit during the spring, and you’ll be welcomed by pink cherry blossoms. 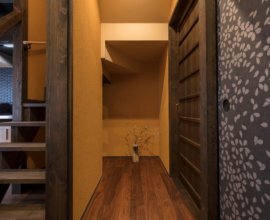 Come during the summer to see the vibrant greenery, the rich colors of red and orange in the fall, and a crisp atmosphere in the winter. 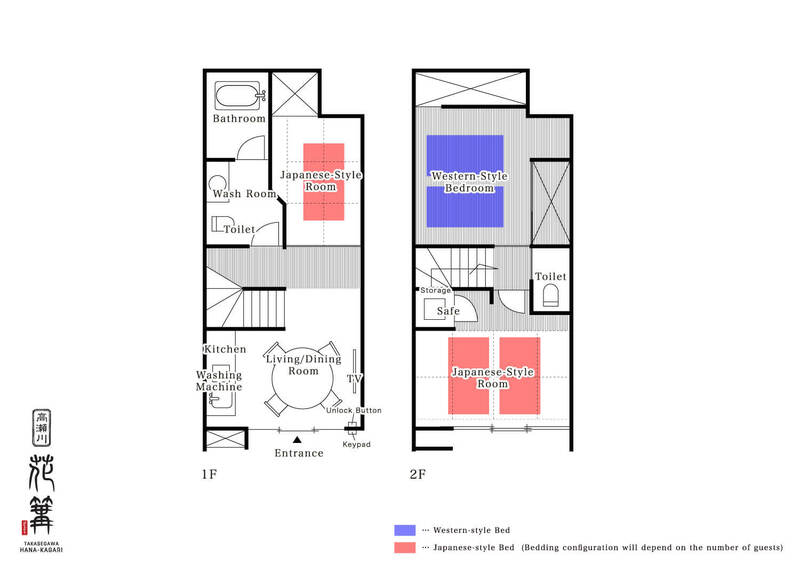 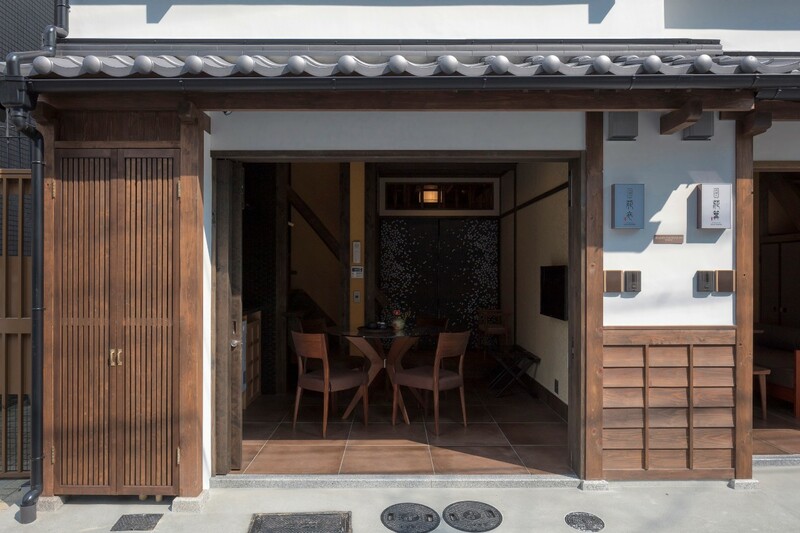 The glass-paned entrance doors of this house will reveal to you a new view with each season. 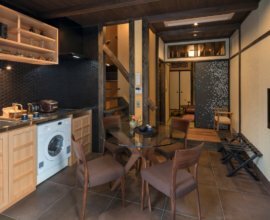 Relax amongst this atmosphere as you experience the unique design of when architecture and nature complement one another. 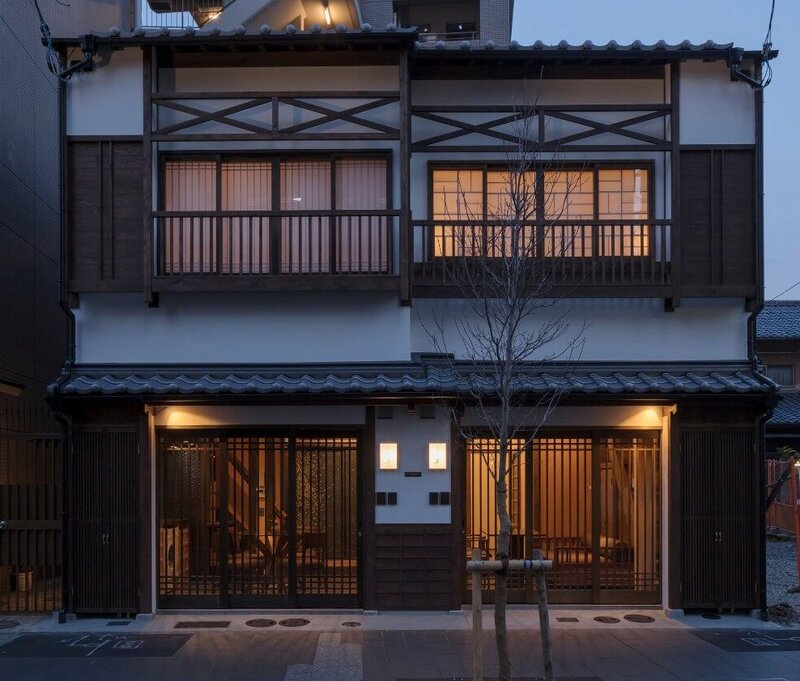 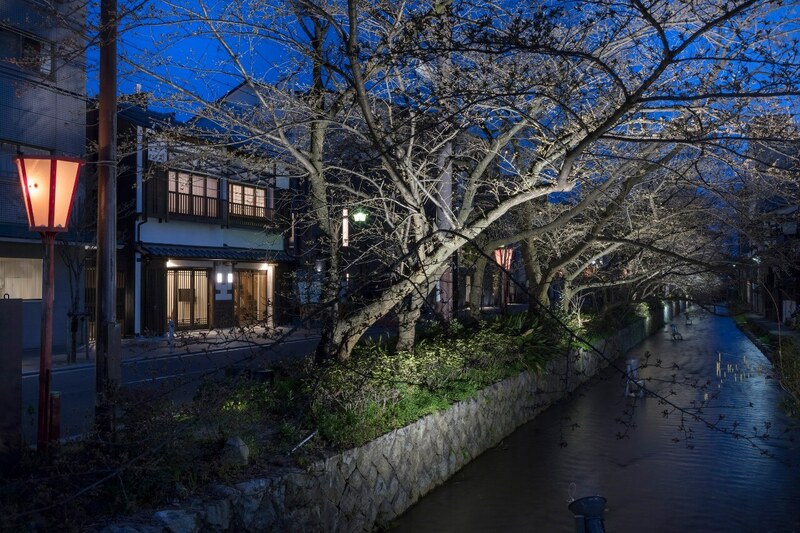 A machiya with a gorgeous view Just across from the gentle Takasegawa River is an elegant machiya with a ‘kawara’ roof. 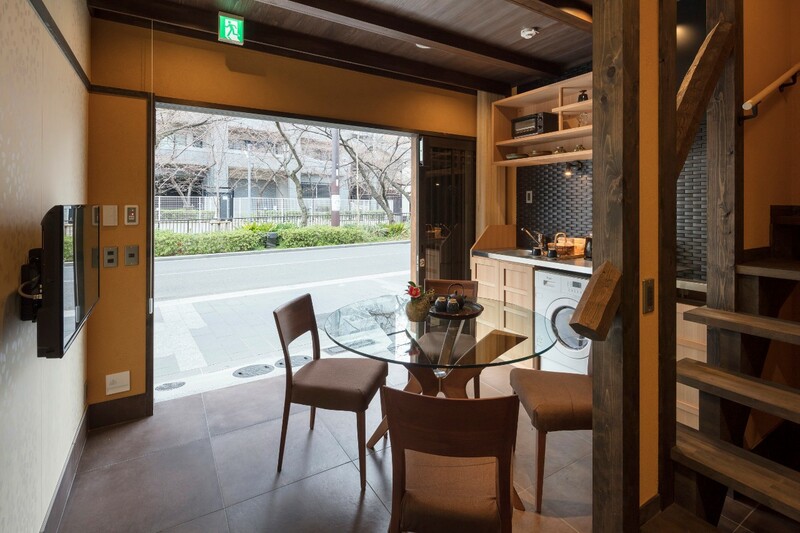 The large glass doors allow a beautiful view of the river from the living and kitchen area." 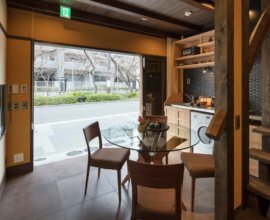 Kitchen and dining area Relax at the dining room table as you prepare a meal using the fully furnished, modern kitchen. 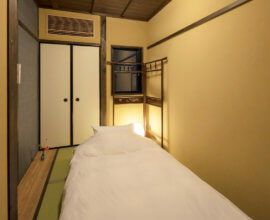 Serene Japanese bedroom Relax in this traditional room with tatami, ‘shoji’ paper windows and a delicate paper later. 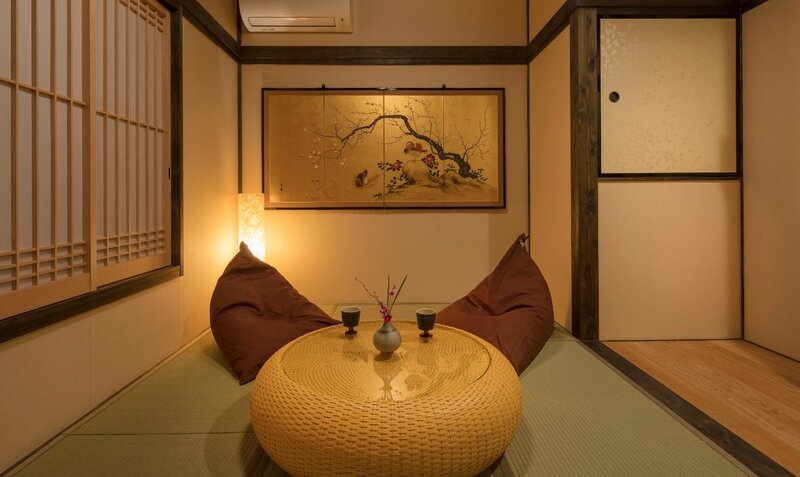 A golden art piece depicting sakura blossoms envelops this space with luxury and warmth. 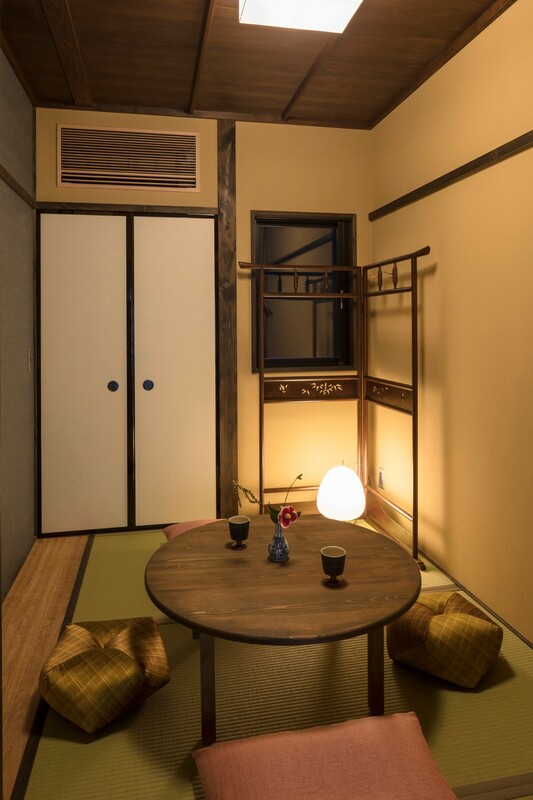 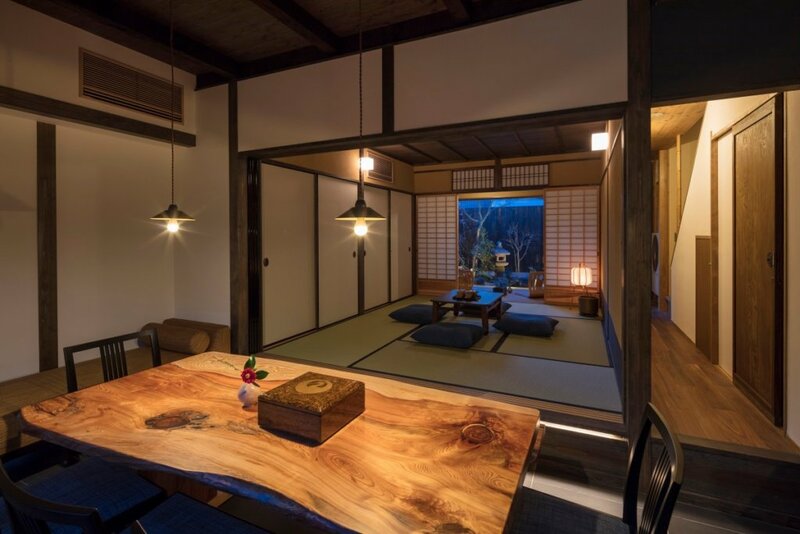 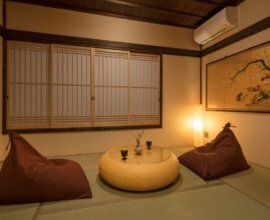 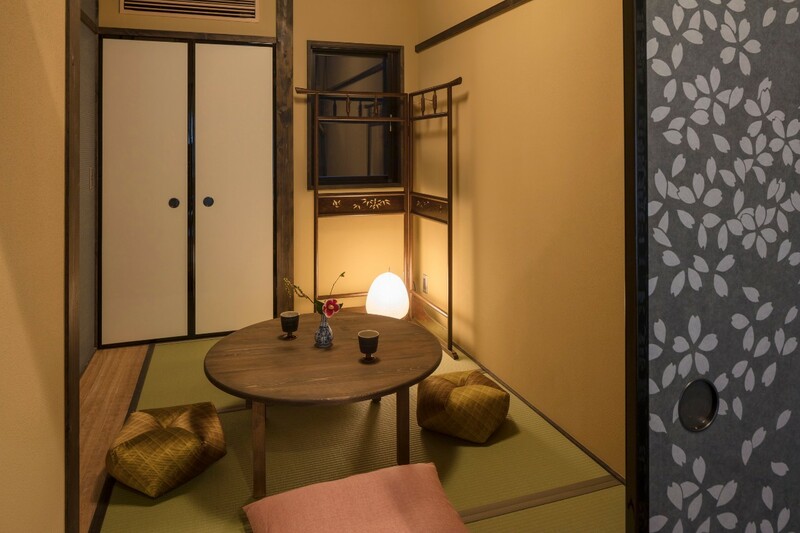 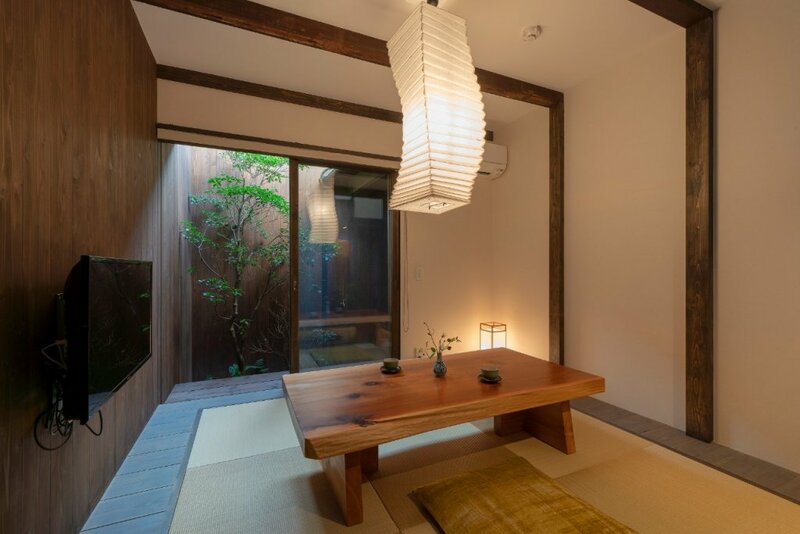 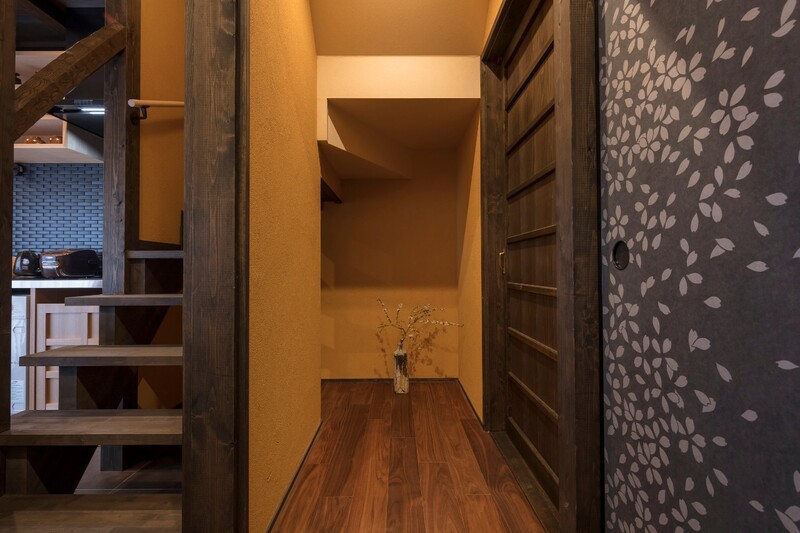 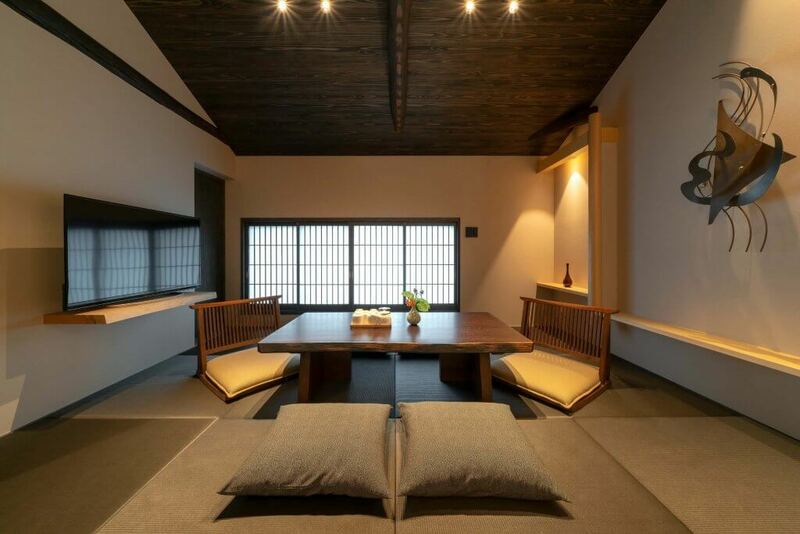 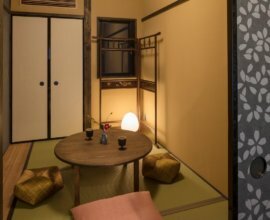 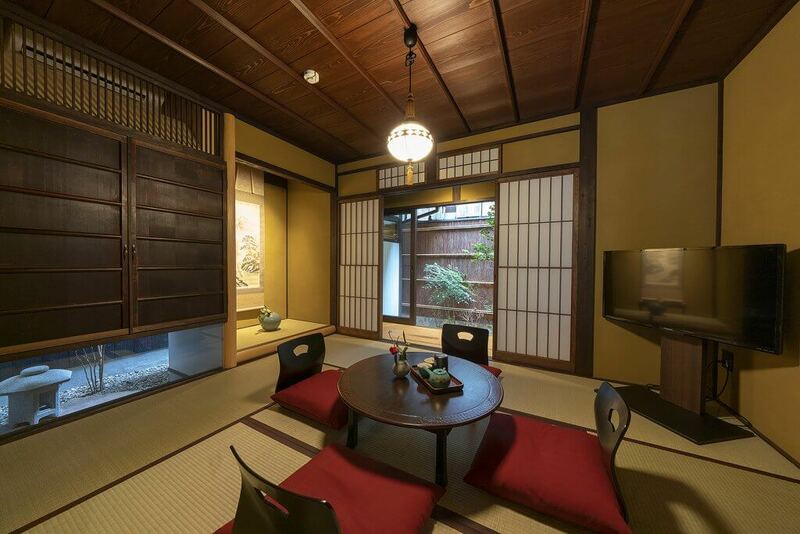 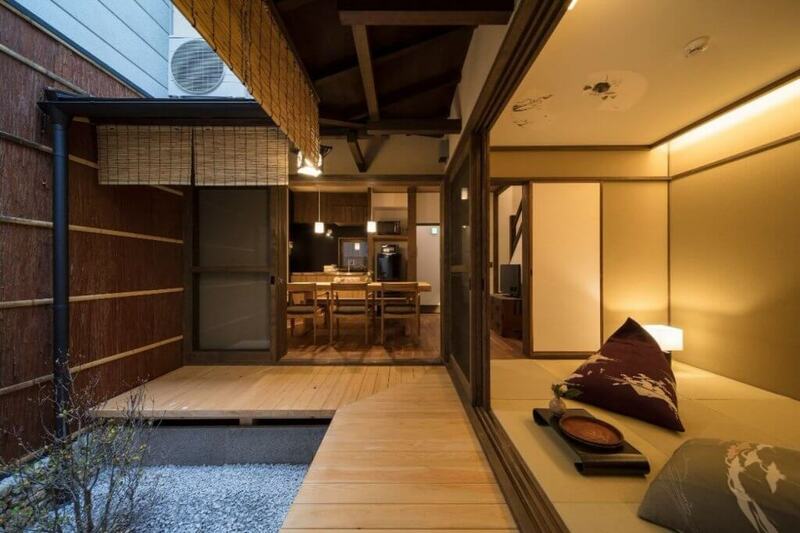 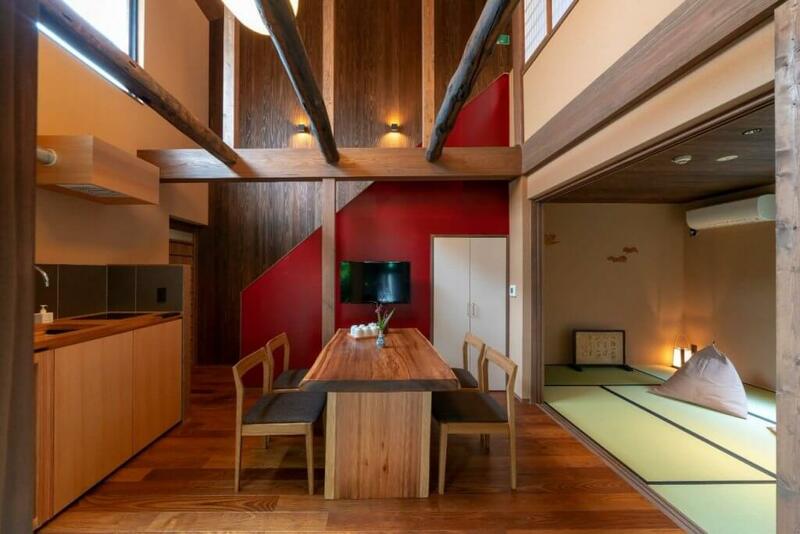 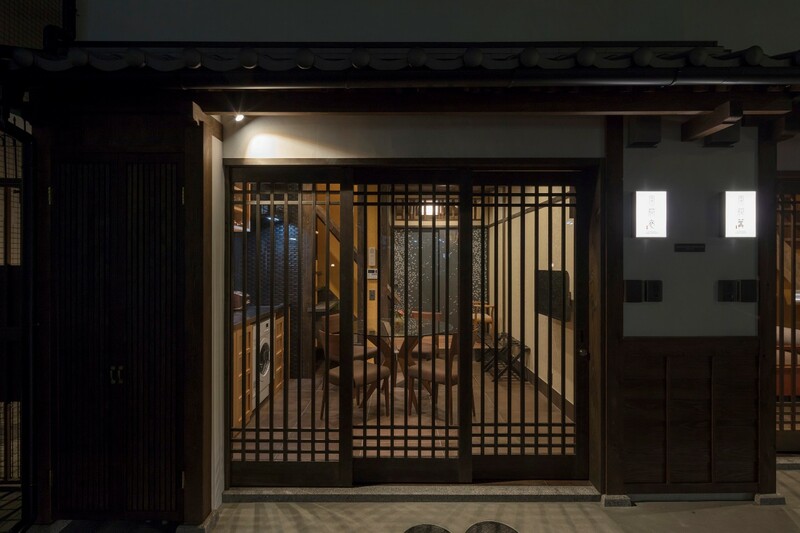 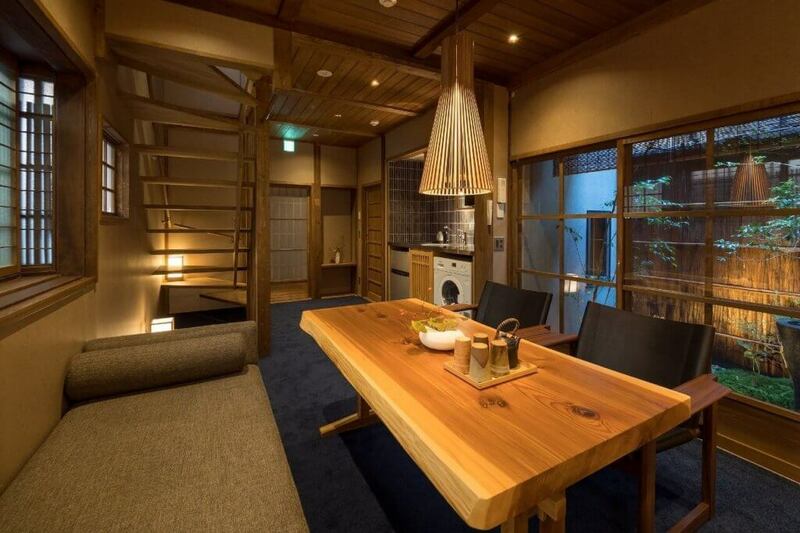 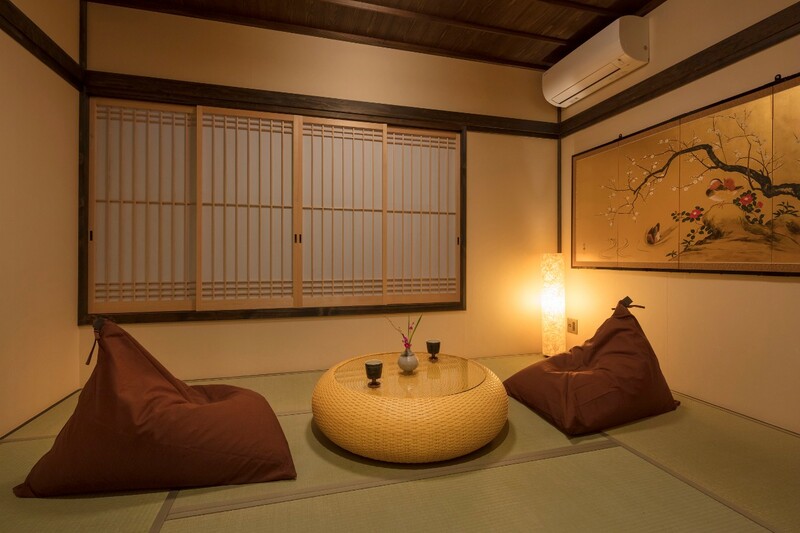 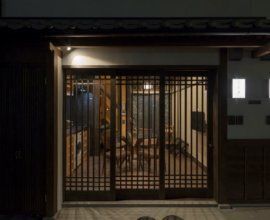 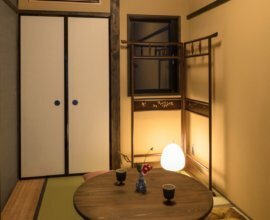 Japanese living room Open the delicate sakura ‘fusuma’ sliding doors to find a tatami room reminiscent of a traditional tearoom. 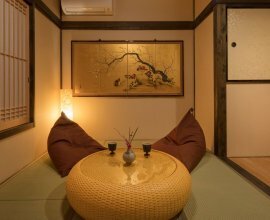 This space can also be used as a private bedroom. 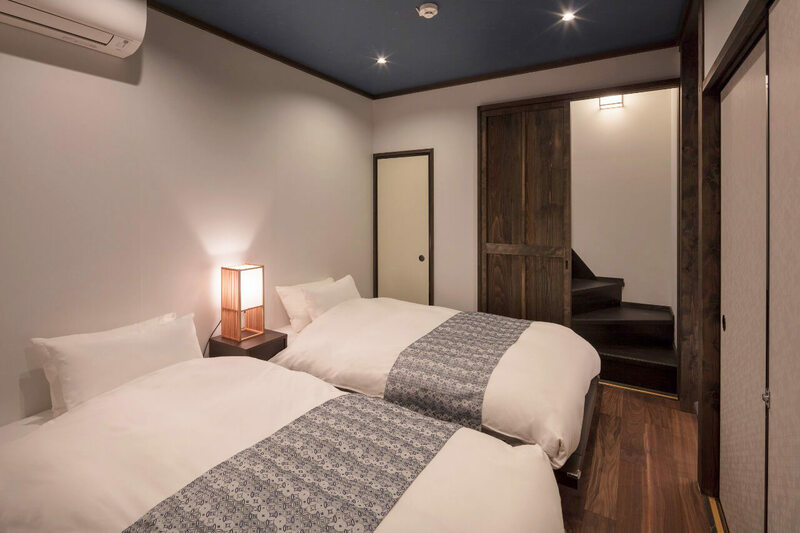 Western-style bedroom A tranquil deep blue ceiling and rich, warm hues of the wooden floors perfectly complement each other to create a calming space to rest. 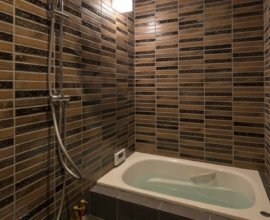 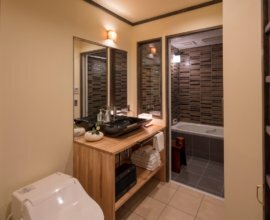 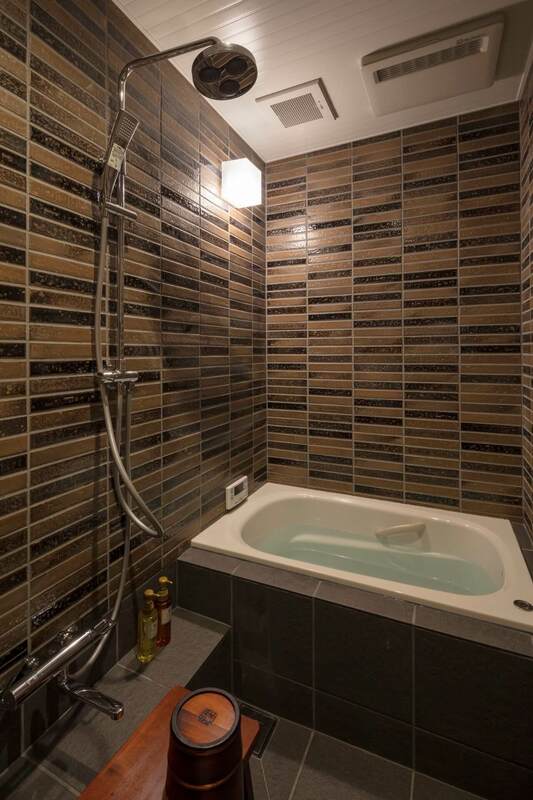 Bathroom Spend a luxurious time relaxing in the bathtub and revitalize under the rainfall shower. 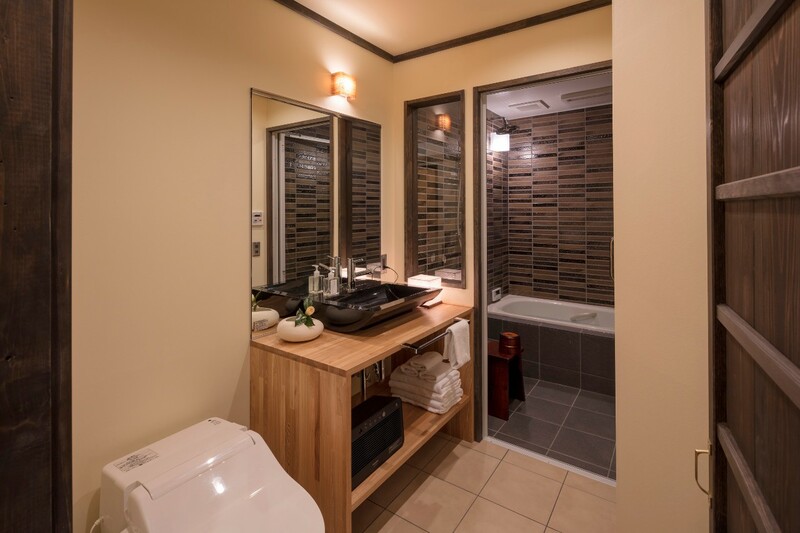 Take in the beautiful lavender and forest scents of our custom curated bath amenities. 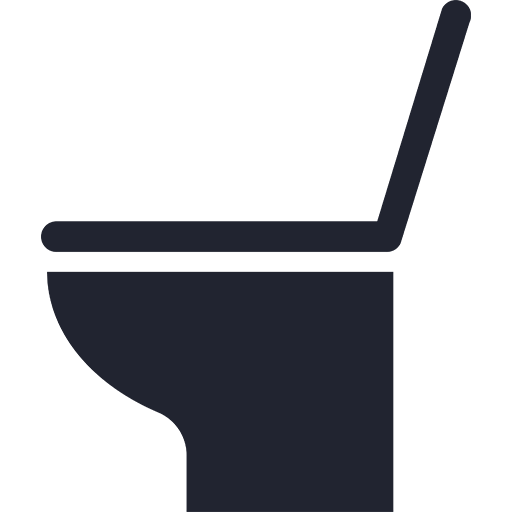 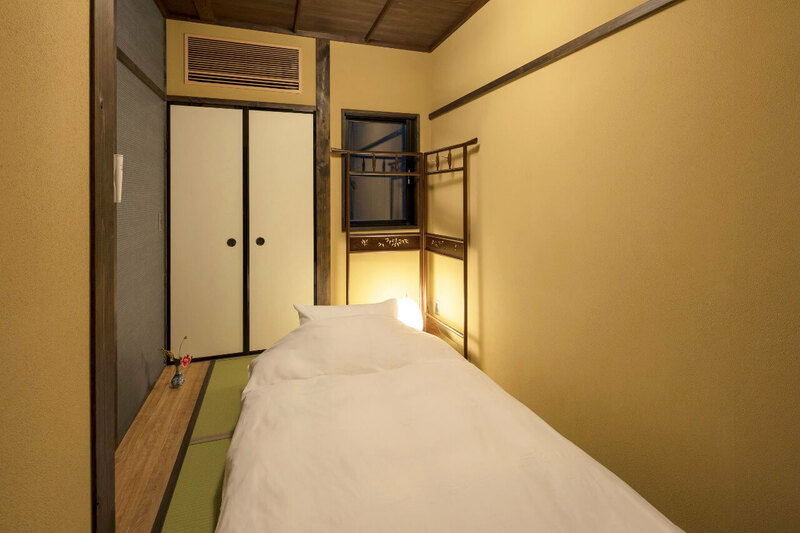 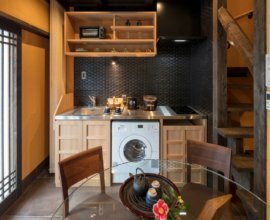 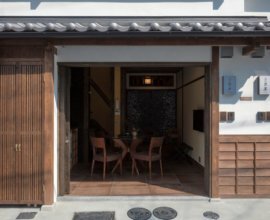 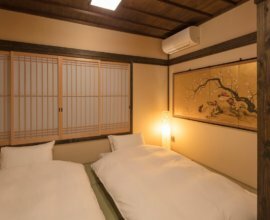 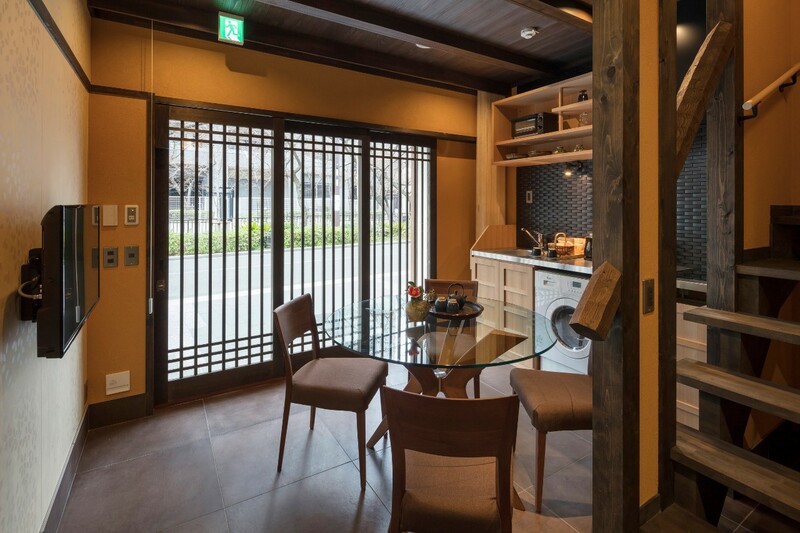 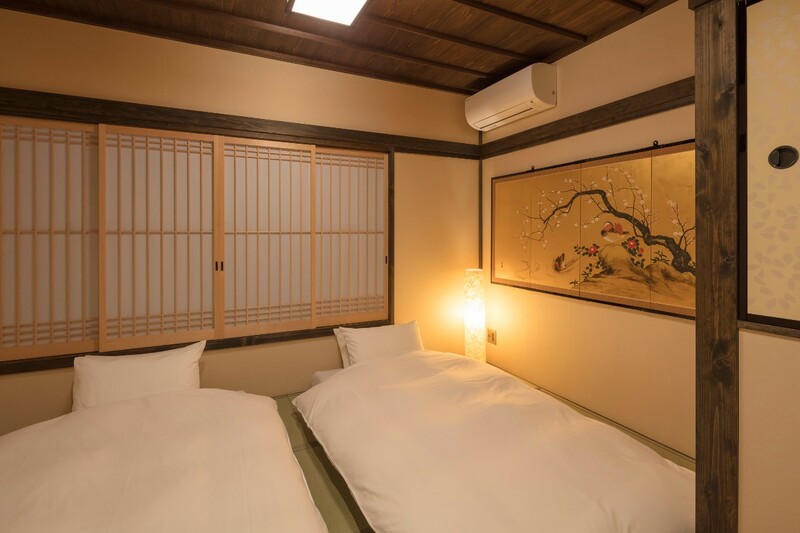 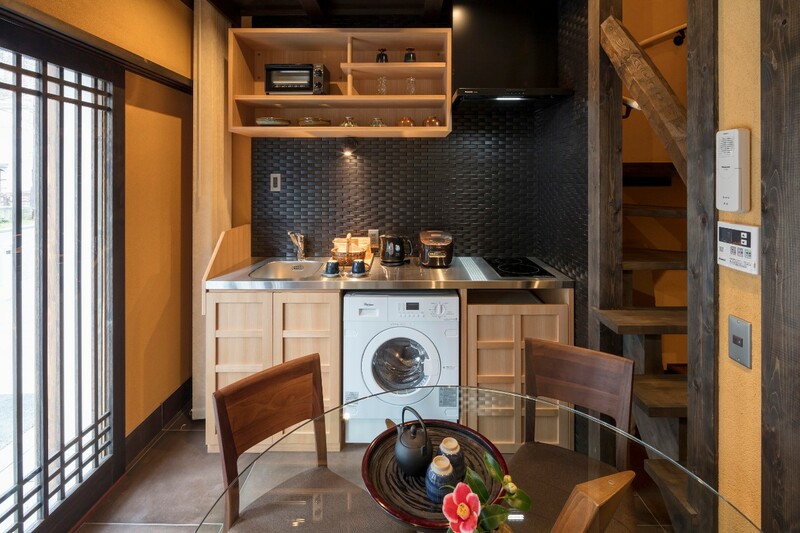 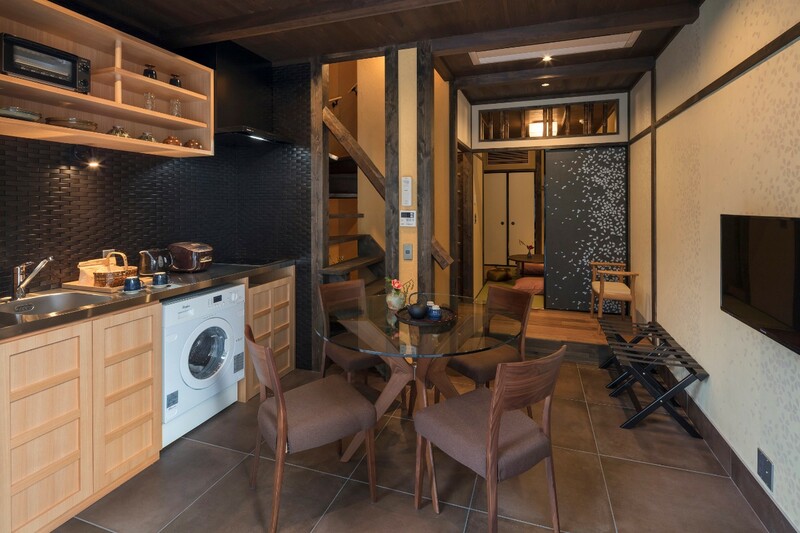 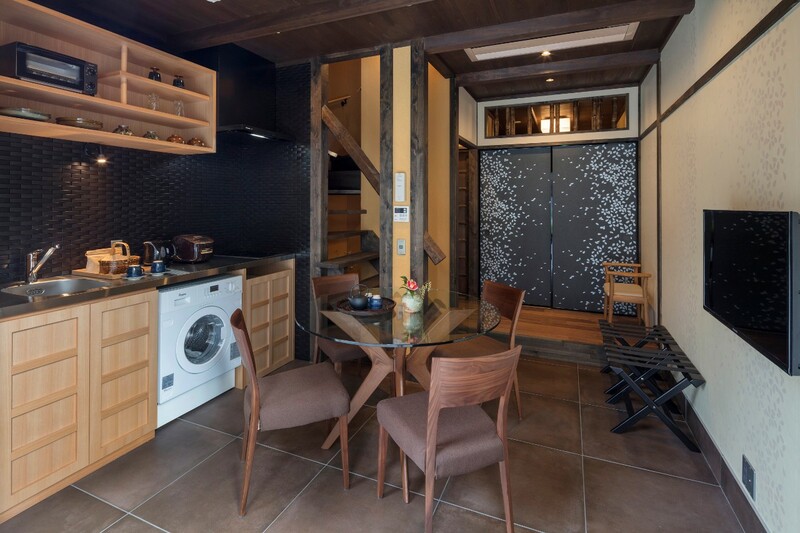 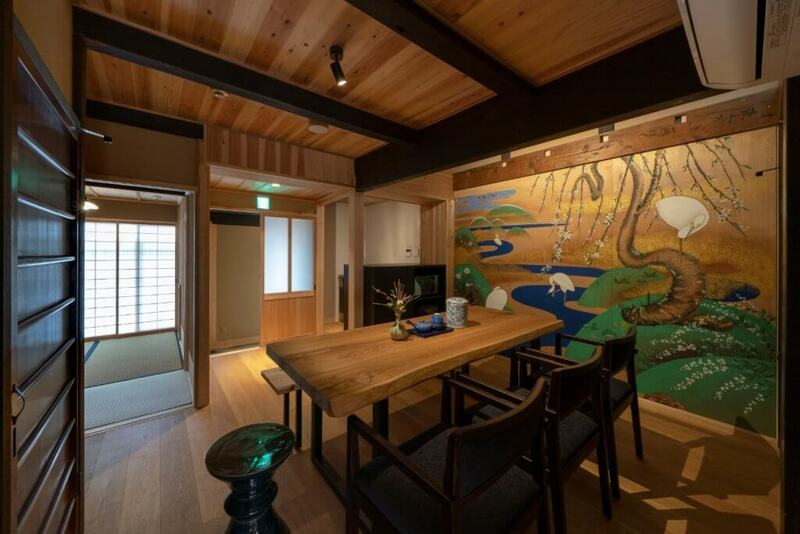 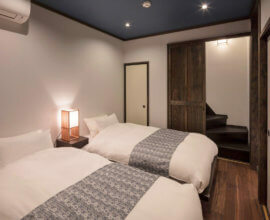 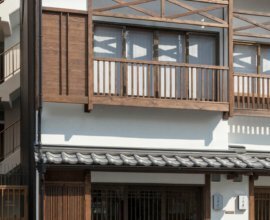 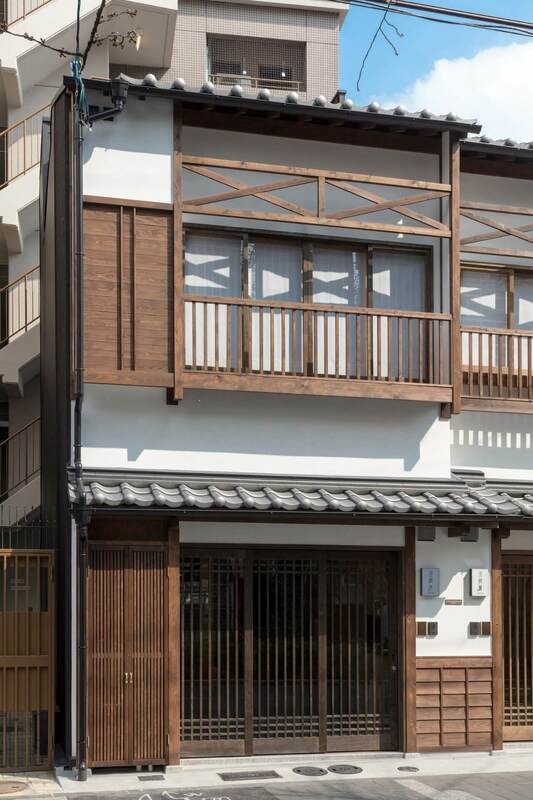 Find Gion and Nishiki Market within easy walking distance from home.Take the train north towards the many modern museums, which showcase numerous art exhibits, fascinating Manga Museum, and more.